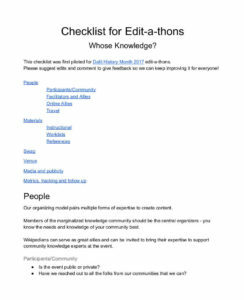 Focusing on the needs of marginalized knowledge communities, this resource provides different checklists useful for running edit-a-thons. It gives information tailored to participants, facilitators, and allies; as well as materials and logistics arrangements to take into account when organizing an edit-a-thon. It also offers examples and further resources that will make the process run smoothly.